I had a hankering for fried rice on Tuesday. I had planned to do leftovers (quesadillas) for dinner, but I kept thinking about the fact that I needed to pre-cook some chicken for Wednesday night’s dinner and if I was going to do that, why didn’t I just make some stir-fry chicken and fried rice? 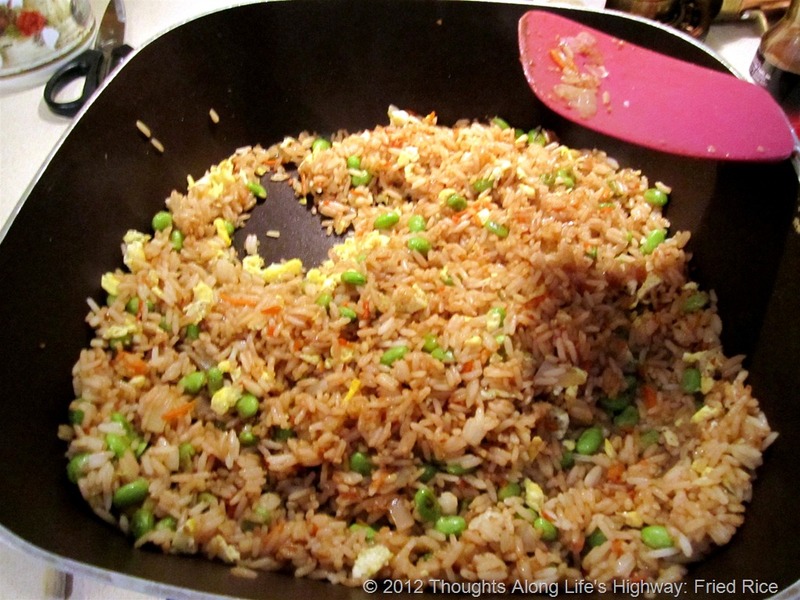 And I have to say, it was one of the best stir-fries I have made and most definitely the best fried rice. Totally awesome. 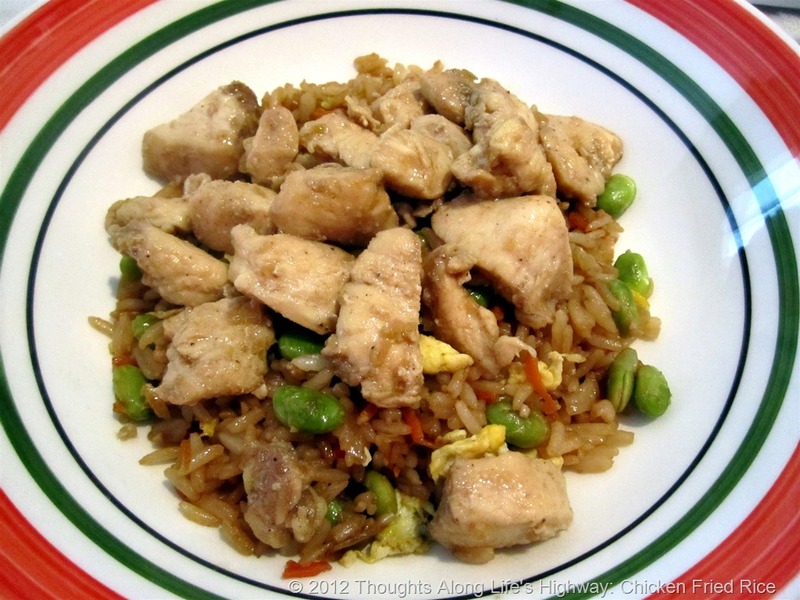 I made it in stages – making the fried rice first and storing it in a pre-heated sauce pot (heated by boiling some water in it and then pouring the water out) while I cooked the chicken stir fry. This would be a good meal all by itself. With the edamame (soy beans) and eggs, you have your proteins and the addition of some veggies would make it a good, rounded meal. And it tastes SO GOOD. You can find the edamame in the freezer section at the grocery store. Just be sure you get the hulled version. I wouldn’t want to be shelling soybeans if I didn’t have to! In a large skillet or wok, spray pan with nonstick spray. Add your egg and cook until scrambled. Remove to plate and clean skillet. In the same skillet, heat approximately 1 Tbsp sesame oil. Add rice to skillet. Cook until the rice is browning and becoming crispy. Depending on how hot your skillet is, this can take 5-9 minutes. The pan does not need any additional oil or moisture at this time. You are trying to brown the rice. While the rice is browning, whisk together the ginger, garlic, soy sauce & brown sugar. One the rice is browned, add the egg and the soy sauce mixture to the rice/veggies and stir well. Drizzle the rice with a little more sesame oil and serve. I served it to the girls with some of the chicken I cooked for the stir fry that SuperMan and I ate with the rice. They gobbled it up happily. (that’s a o sooo good food MB says) – I found this typed in my blog writer after I got back from taking the girls to school. I guess that is her editorial contribution. I’ll share the stir fry recipe later this week. It was the perfect accompaniment to the fried rice. I can’t wait for lunch today to eat the leftovers!